Over the winter I have read about a number of greenhouse projects and so I thought I should do something about ours. As readers are aware, much of my garden plot is on an old cinder tennis court and we have found that raised beds on cinder don’t work particularly well. It’s the same with the greenhouse – pots fine but raised beds, no! So this winter I have dug out some of the cinder, fastened some breeze blocks in place with a timber rail to make a retaining wall and then filled in with branches, leaves, hedge trimmings, compost and soil. We wait to see if this is effective. 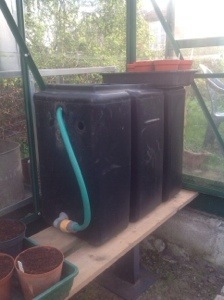 I have also finally put an old black plastic header tank that was removed from our roof space about twenty years ago into the greenhouse. Hopefully the water will heat up during the day and keep the greenhouse a bit warmer during the night as it releases the heat. 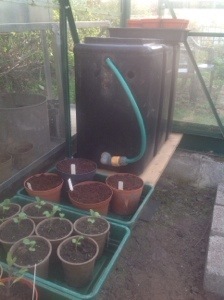 It also acts as a reservoir of water for watering plants and as a shelf! As I don’t have a spare tap at the moment I have attached a bit of hose pipe that tucks up through one of the holes. Someday I may even try to set up an automatic watering system in case we ever go away.